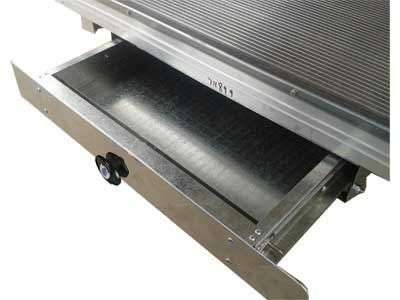 The BOLT Undertray Trundle Drawers are made in Australia and are made from heavy duty galvanised steel. The drawer is fully enclosed, waterproof and dust resistant and also has a heavy duty sealed draw bearing system for seamless opening. The BOLT Trundle Drawers bolts straight up underneath the tray and for a flush finish fir the trays combing rail will need to be cut. Undertray Trundle Drawers are bery practical storage system, allowing wasted space to be utilised to its maximum. The Drawers are very secure with a BOLT Lock T Handle Lock, and twin point locking system. Each Drawer is rated to 150kg carry capacity but have a low profile to allow the Drawer to fit straight under the tray. There is no need for the tray to be raised which aids in keeping the overall height down.